On sale while supplies last! There's no need to rush out in a panic if you're late to lock in the prized flock at night. This is the latest model of our Automatic Chicken Door, powered by a new motor drive unit that is electric and battery-powered all in one. Plug it in, run it off batteries, or upgrade to the solar kit option--the choice is yours! Either way, you're safe in a power outage because the batteries will act as a back-up, even if the power is off. An LED Fault Indicator Light will alert you to power issues with either the electricity or batteries, so you can rest assured a problem isn't going to "sneak up" on you. This automatic chicken door can be open and closed on a timer. No worries if your battery dies: you can open and close the door manually. The "Basic" model door is made with maintenance-free materials and is easy to install, right out of the box. The heavy duty poly/aluminum construction is water resistant and will not rot or warp. Enjoy a tight fit and an easy-gliding track that will always go up and down with ease. Wires and sensors are kept safe, dry and clean inside the motor box. Parts are easily removable for cleaning. The motor unit has a self-explanatory LED programming screen. 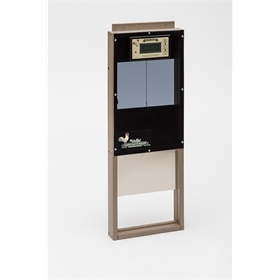 Your automatic chicken door arrives assembled, including a complete frame, sliding door, electric motor, 110v adapter, timer, and a full motor box cover with six screws for easy access. The battery pack takes four AA batteries, not included. The Advanced Model Automatic Door has GPS functionality, which allows you to set your latitude and longitude coordinates, and once configured and saved, you can set your door to open and close up to 4 hours before/after sunrise and sunset. If you're not satisfied with this product, you may return it for a full refund within 10 days minus our cost to ship the item to you and minus your cost to ship the item back to us. Your purchase also comes with a one-year manufacturer's warranty!